In keeping with the rich Hindu culture on the island of Bali the APS Indonesia Bali office held its renewal Blessing Ceremony. 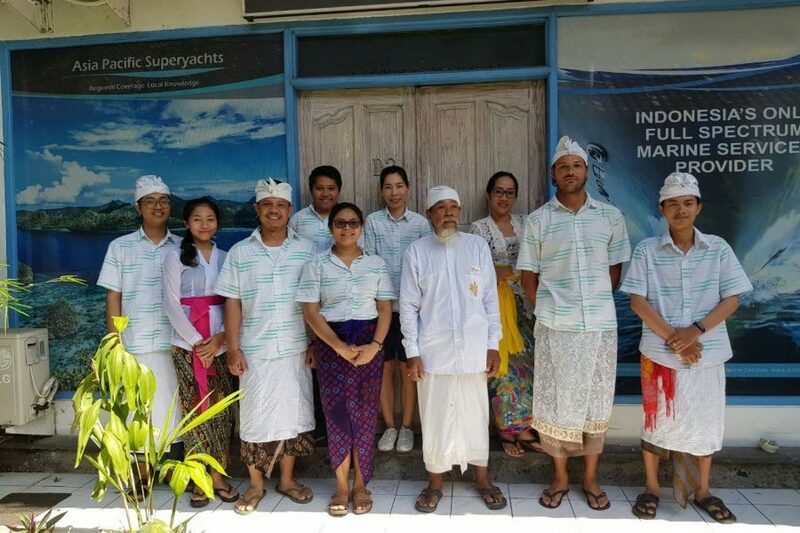 A wonderful spiritual event was held with the local district Pemunku (Balinese Priest) leading blessing prayers and a ceremony with all of the Asia Pacific Superyachts (APS) staff in attendance and in Balinese dress. APS Operations Manager Guna Pisaneschi, proudly Balinese, explains, "These ceremonies are very important for the individuals in our team and for peace of mind in our workplace", adding, "Our team's ability to service our clients and to be happy and calm as individuals depends on our spiritual well-being and of our work area being in good condition. The renewal ceremony helps and supports this". "The APS Indonesia Bali office is proud to have been servicing visiting and resident Superyachts for the past10 years. Notable boats such as Pelorus, Ecstasea, Mayan Queen 4 and Ocean Victory - are just a few of the many boats having felt the warm embrace of Bali and the Asia Pacific Superyachts first class service and logistics facilitations", notes Asia Pacific Superyachts Indonesia co-founder, Captain Jimmy Blee. "We understood early in our set up that we as a company needed to embrace the local culture and that it was very important to our Balinese staff that the office and the operations be blessed at the direction of our Pemunku. "Our Bali office is blessed by the staff in daily rituals; however, the Renewal Ceremonies are an important aspect for us all. To be frank, they are an integral part of why APS Indonesia has grown to be the industry leader in superyacht services here in Indonesia." "We have nine staff in our Bali office and an enormous services coverage of 17,000 islands", highlights Thomas Taatjas, APS Indonesia GM: "The challenges of providing services over these distances and the logistics required to do so are substantial. The team in the Bali office do an amazing job for our client boats. Our long track record of happy Captains and crews attest to this." Captain Jimmy, Thomas and the APS team can provide excellent support and a broader information base for visiting boats, along with any services or information desired in or about the "Heaven on Earth" that is Indonesia.